Who's the king of Liberty City? Prove yourself against other fans and Rockstar Games in the multiplayer event this Friday, January 25th, from 11 AM to 2 PM Eastern Time US on all platforms. Enjoy the two live streams and enter to win prizes including some Grand Theft Auto V gear! The devs will play a mix of GTA IV, Lost and Damned, and Ballad of Gay Tony matches throughout the event. 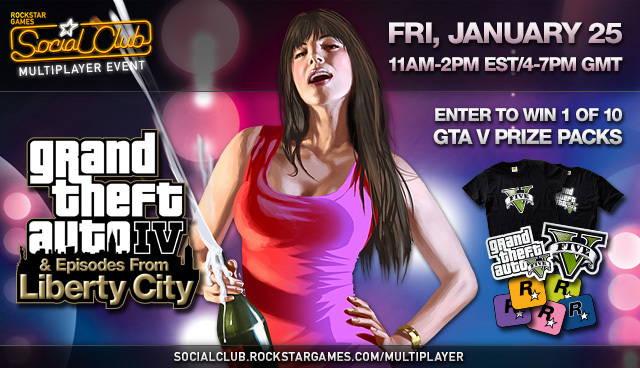 Two of the devs will be streaming their GTA IV gameplay live on the Social Club Multiplayer Events page with a live chat and sweepstakes entry to win GTA V shirts and stickers plus Rockstar logo stickers. A third video stream will run on the Rockstar Twitch page with a second hosted chatroom. They'll accept as many invites as they can during the event, but play with other Social Club members to make sure you get in on the action. Getting in a game with a dev is not a guarantee, but it is something Rockstar absolutely attempt to do for as many people as they can. Want to know which multiplayer mode the devs are about to play? Pay attention to the live chat on the Social Club Multiplayer Event page. They'll begin in Grand Theft Auto IV in GTA Race, and later progress to The Lost and Damned in the second hour and The Ballad of Gay Tony in the final hour. Use the in-game cellphone to select the mode they're playing during the event. For team-based modes such as Team Deathmatch, gather your friends using Party Mode. You can also hit up the chat during the event. In single player, open the in-game mobile phone by pressing "Up" on the d-pad. Select Multiplayer > Party Mode > Yes.